The original 1982 Fighting Fantasy gamebook paperback, written by Ian Livingstone and Steve Jackson, has been transformed into an epic table-top adventure game, with new areas to explore, characters to meet, and of course, monsters to slay! Zagor's home assembles right before your eyes as you travel deep into the belly of the mountain. 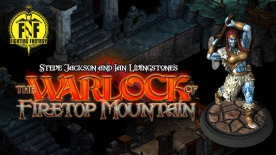 Each character has their own motivations for being in Firetop Mountain, changing the way the gamebook is written and choices presented. Combat is fought using the digital miniatures in a simultaneous, turn-based system called GridBluff, and the game includes over 100 unique hero and monster figurines to discover.